Direct from the 'Tim & Eric Awesome Show, Great Job! 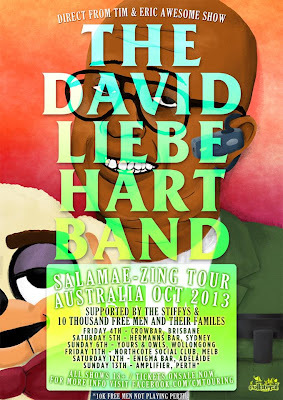 ', DAVID LIEBE HART will be boarding the next Korendiand space ship and landing on Australia this October. Joining the puppet master in his quest for ying yang will be his very own band performing their brand of old school punk rock with offbeat song topics ranging from his love for Reba McEntire, getting bad service at the grocery store, and Liebe Hart's many ex-girlfriends. And Ten Thousand Free Men and Their Families will be playing the whole tour except Perth! !